A proprietary coating service developed for EPI reactors, hex reactors, CVD systems, and ion implanters, Microcoat® is a novel offering by A&A Coatings. We are a unique company devoted exclusively to the application of metal, ceramic, cermet and hardface coatings, years of experience with this process led to the development of Microcoat™ coatings for the electronics industry. 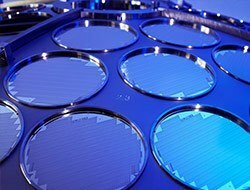 These coatings were developed years ago, while working with the early developers of reactive ion etching techniques to overcome problems associated with the manufacture of integrated circuits. The initial R&D on Microcoat™ coatings began in 1979 to help overcome the problems of metal contamination and incomplete removal of material in the circuit; bridging end open faults; risk of non-localized etching and increased maintenance. Today, many leading chip manufacturers are benefiting from A&A Coatings’ coating development. Thousands of wafer trays, caps, supports, retainers, covers and handles have been coated with Microcoat™ coatings. Microcoat® coatings are specifically developed, chemically pure proprietary blends providing proper density, adherence and low Porosity characteristics required for dry-etching and ion implanting. Whether you are an OEM of IC production equipment or a manufacturer of integrated circuits, you should be using Microcoat® protective coatings.